Hide this Dealer (Madan Mohan) Discover properties by other dealers by hiding those whom you have already spoken to. You won't see them in your searches further but you can unhide anytime later. Hide this Dealer (satish bhosale) Discover properties by other dealers by hiding those whom you have already spoken to. You won't see them in your searches further but you can unhide anytime later. Suyash Nisarg, located in Pune, is a residential development of Suyash Developers. It offers spacious and skillfully designed 1BHK, 2BHK and 3BHK apartments. The project is well equipped with all the basic amenities to facilitate the needs of the residents. The site is in close proximity to various civic utilities. Where is Suyash Nisarg located? The project is located in Hadapsar, Pune. What are sizes of apartments in Suyash Nisarg? The apartment sizes in the project range from 962.0 sqft to 1468.0 sqft. 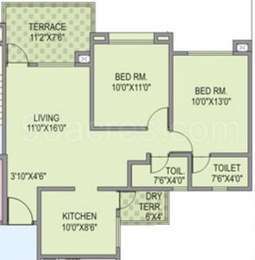 How much is area of 2bhk in Suyash Nisarg? Two-room units (2BHK) in the project are available in an area of 962.0 sqft to 1139.0 sqft. How much is the total size of Suyash Nisarg?The project is spread over an area of 3.0 Acres. What is price of 2 bhk in Suyash Nisarg? 2 BHK apartments in the project are available at a price of Rs. 4500000 to Rs. 5500000. Is the project Suyash Nisarg in Hadapsar, Pune ready for possession? Dont trust the builder, he breaks his every promise and be ready to spend a lot of money even after getting the posession. The construction is faulty and you have to get the things fixed on your own as builder will not be agreeing to his faults. lots and lots of issues with this builder. NEVER BUY ANY FLAT FROM SUYASH DEVELOPERS. even after getting the posession 1 year back, the residents are facing water issues and parking issues. NO PARKING (dedicated). Park where u want. Suyash Nisarg's Phase 1 is ready for possession. Which phase are you talking about?